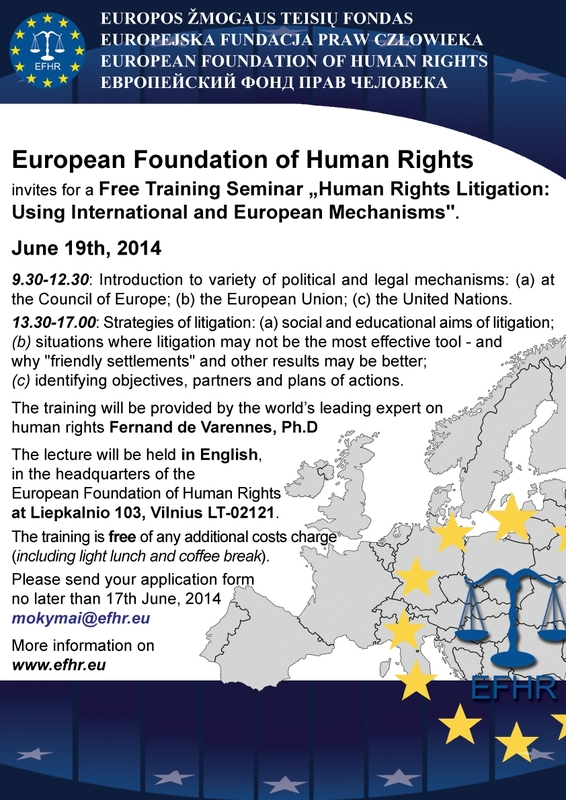 EFHR invites you to a free training session! 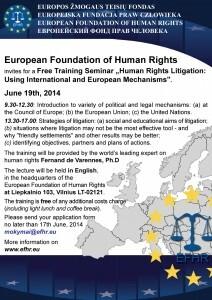 On June 19th 2014, the European Foundation of Human Rights would like to invite you to a free training seminar, „Human Rights Litigation: Using International and European Mechanisms”. Members of vulnerable groups in society such as women, minorities, immigrants and individuals with disabilities must at times use litigation as a tool to ensure the protection of some of their basic rights, especially when politicians, government officials and even the majority population are unaware, unresponsive or even insensitive to their rights. This training seminar will look at the use of a large number of political and legal mechanisms available to vulnerable groups to try to ensure a better appreciation for and protection of their dignity through international and European human rights mechanisms. The training is addressed to lawyers, judges, administrators and students, as well as to all others who are interested in these issues. The lecture will be held in English, at the headquarters of the European Foundation of Human Rights at Liepkalnio 103, Vilnius LT-02121. The training is free (and a light lunch and coffee break will be included). Participants will receive certificates for taking part. identifying objectives, partners and plans of actions. Fernand de Varennes, Ph.D – obtained a BA Law degree in Canada and an MA degree from the London School of Economics and Political Science. In 1996 he obtained his Ph.D. degree from Maastricht University in the Netherlands. F. Varennes founded, among others, the school of the first LL.M (Latin- Legum Magister, commonly recognized Master of Laws degree) in the field of human rights. He has taught students in Europe, Asia, North America and Australia. He has been an advisory member in many world research centres, and has written over 150 articles and books. Currently, he is writing a new book on linguistic rights and a 3 volume book on ethnic and international conflicts.